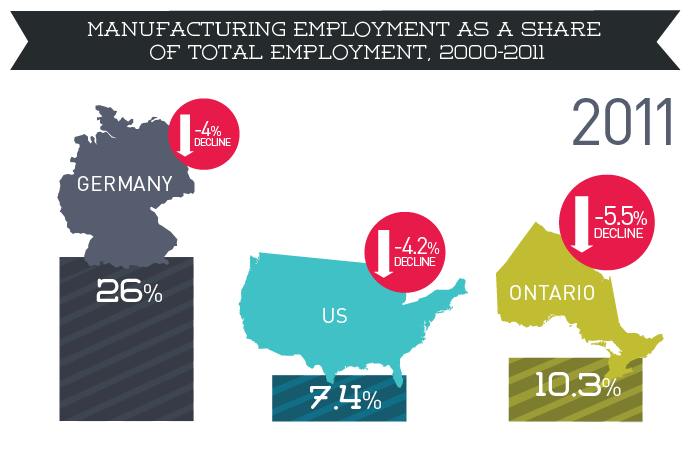 There are about 300,000 fewer people working today in Ontario’s manufacturing sector than 10 years ago. This has been devastating for the people and communities affected. What is behind the decline? And is there anything governments can do to reverse it? Ontario’s problem is not unique. Manufacturing jobs have been disappearing in just about every developed economy for the past two decades. The rise of automation in manufacturing plants means that factories today have more robots and fewer workers. In the case of products that still require a lot of workers, jobs have been transferred out of wealthy countries to countries with much lower labour costs. 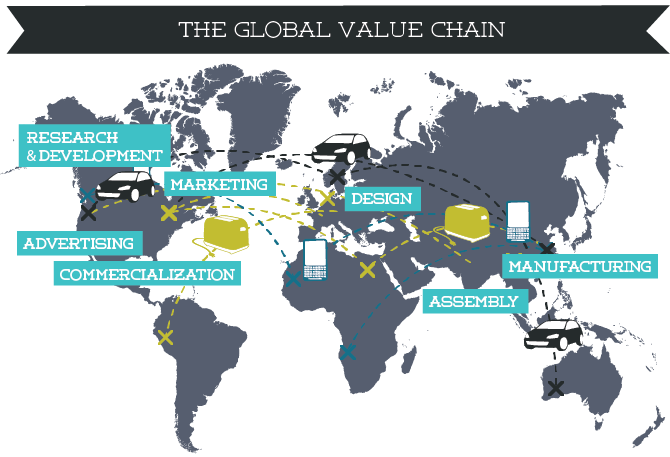 This development, supported by lower tariff barriers and transportation costs, has contributed to the rise of the Global Value Chain, which can be understood as a more refined, global division of labour based on competitive advantage (see chart below). It means Ontario cannot compete on wages with low-cost jurisdictions in Asia or Latin America – nor do we want to. 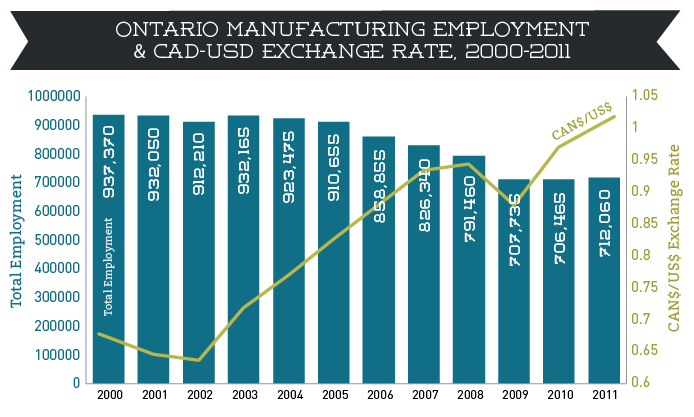 The rapid rise of the Canadian dollar compared to the American dollar over the past decade has caused a significant decline in manufacturing exports and thus employment in Ontario. Our most important customers are in the United States. As the Loonie rose higher, so did the cost of our goods. According to the Bank of Canada, the appreciation of the Canadian dollar explains “most of [the] deterioration in competitiveness” of Canadian firms. 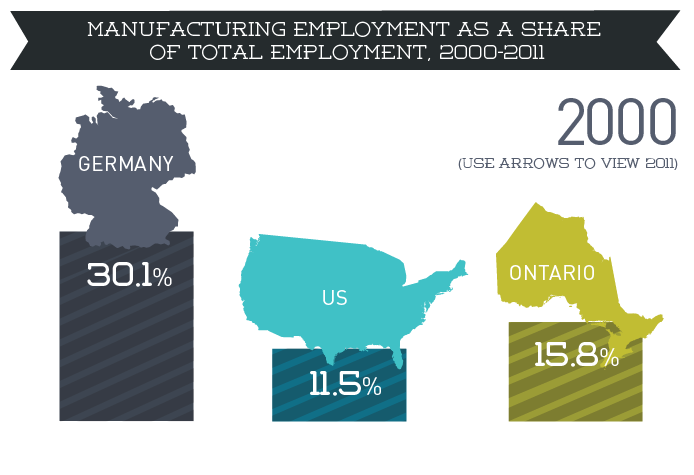 Many manufacturing firms have shut their doors and even more individuals lost their jobs as a result. Canadian firms have not invested enough in productivity. When it comes to job training, ICT, research and development, and machinery and equipment, Canadian manufacturers have fallen way behind. That means our firms are about half as productive as our American competitors. The so-called ‘productivity gap’, the difference between output per worker, has widened between Ontario and its North American peers over the past several years. Manufacturing output and employment also decreased in 2008 due to the global economic crisis and recession that followed. Demand in the U.S. remains low and so as long as economic growth in the U.S. remains moderate, the prospects for significant job growth in manufacturing are tepid. But new opportunities are emerging. Some firms are re-locating plants back in North America. So what can governments do to help? First, they must create the right business environment for investment. They have already done so, implementing the private sector’s recommendations to lower corporate income taxes, eliminate the capital tax, and harmonizing the provincial sales tax with the GST. But these policy choices have had only a marginal impact on employment. Even lower taxes are not the answer. Our tax environment is already amongst the most competitive in the world. Instead, we need to invest to ease congestion, support science and research, improve the livability of our cities, ensure the trustworthiness of our regulatory system, and educate our workers so we don’t lose our comparative advantages in attracting foreign direct investment. We need to increase productivity, diversify our export markets and support the growth of industry leaders. 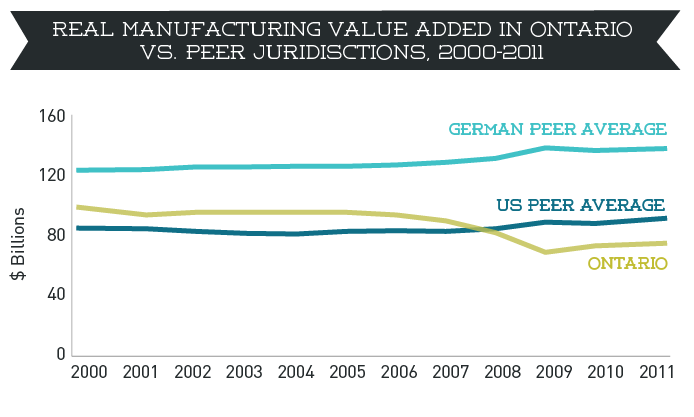 These kinds of policy approaches will not bring back traditional manufacturing jobs. Many of those jobs are likely gone forever. But the right public investments will provide the necessary foundation for the next wave of Ontario prosperity, aligned with a very different world economy, a different kind of advanced manufacturing sector, and with Ontario’s competitive advantages. We need to invest to ease congestion, support science and research, improve the livability of our cities, ensure the trustworthiness of our regulatory system, and educate our workers. 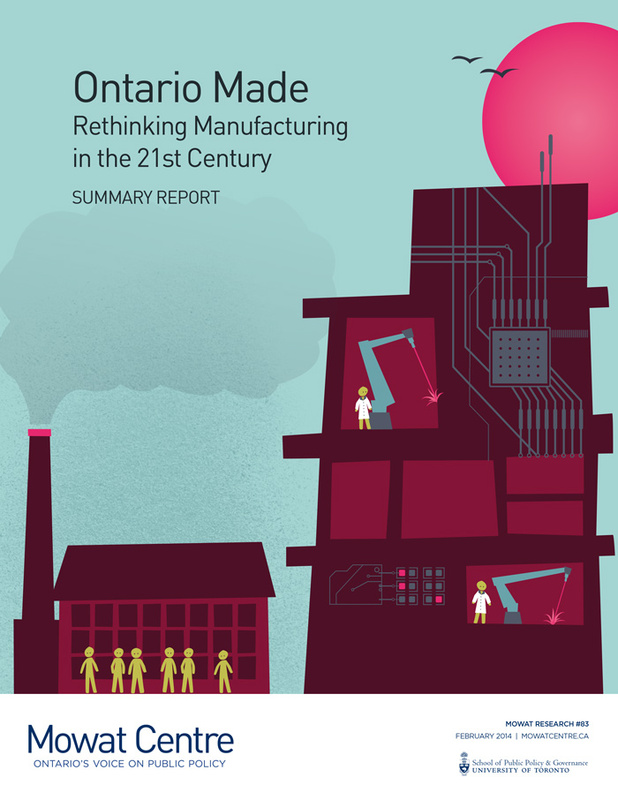 This summary report assesses the current state of the manufacturing sector in Ontario, explains why the sector has been facing challenges and outlines a practical strategy for renewal. 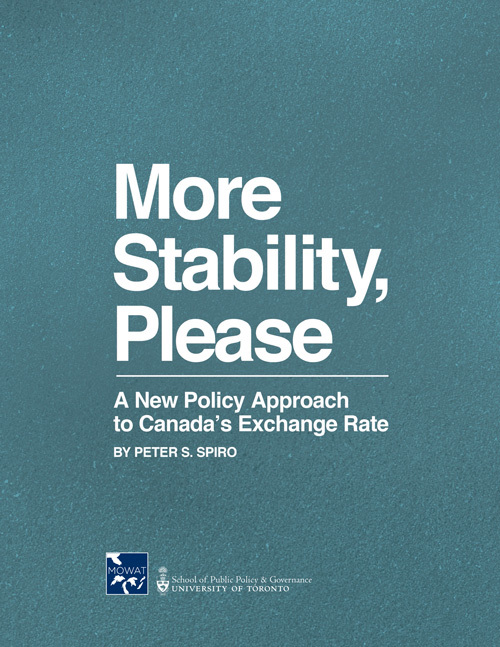 In recent years, Canada’s exchange rate has been at historically high levels. 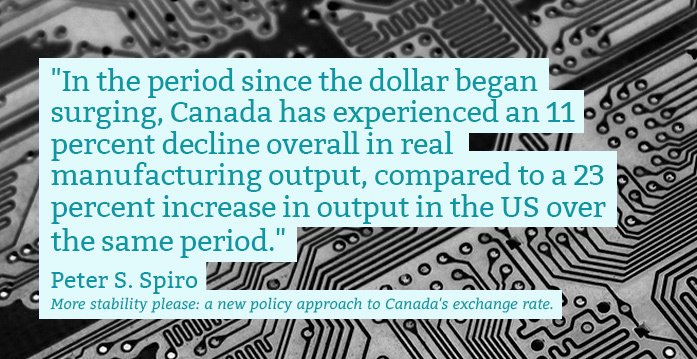 There are differing views on the extent to which this high exchange rate, generated in part by a booming resource sector, has hurt other parts of the Canadian economy. 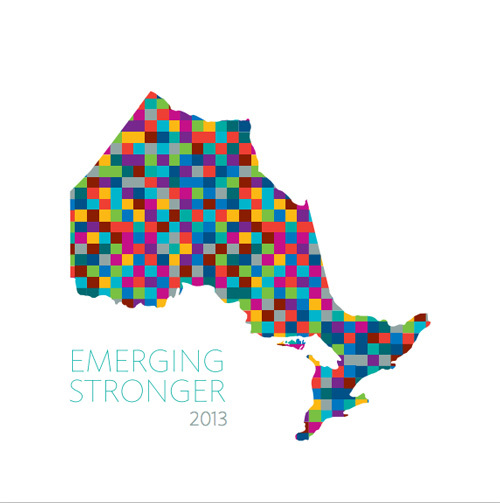 Emerging Stronger 2013 surveys the progress that business, government, and civil society have made over the past year. It identifies the challenges we still face, and sets out the tangible steps we must take to ensure that Ontario emerges stronger from this period of economic transition.